Here is our Uncle Cor, teaching this Monday Morning on the topic ‘Own your workspace’. 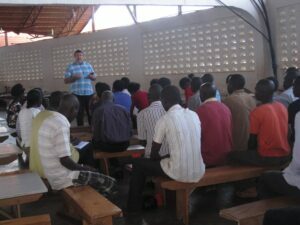 He is one of the Founding Directors of Heart For Children-Uganda. Together with Grace Awori Koelewijn-Omalla, his wife, they started this initiative of setting aside 30 minutes before the week starts and teach some of the values and ideas that make the Kimbilio Family what it is. They take bits and pieces of the Kimbilio vision and make it alive for the members. After all, if the children are to be modeled into Christ followers, we better start training the staff members first. Todays teaching was about the attitude of Joseph, who, even though he was sold as a slave, dis not sit down next to the rubbish heap and morn his miserable condition but rather, he took a broom and a bucket of water to clean up his space and by doing so, was noticed by his owner. We know the story; he was put in charge of the whole household of Potiphar. The story repeated itself when Joseph was thrown in prison, a most miserable place. What did Joseph do? Well, the exact details are not written in the bible but whatever he did was drew the attention of the jailer. I imagine he was sweeping his cell clean and refused to live the life of a slave. He was more than that. Inside, he was a prince, a royalty, which became visible on the outside! At the end of the teaching we all pray for our own lives, asking the Lord to help us do better each day. To be safe and a blessing to the children we serve.